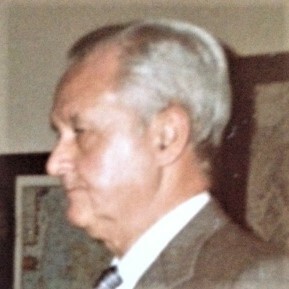 Bernard Lavin, 1985. Photo credit: Frances Sullinger. He held senior Public Diplomacy positions in South Africa, Nigeria, and Indonesia too, but Bernard J. “Bernie” Lavin (d. 2002) would surely have said his greatest contributions in the field of Public Diplomacy were in Korea. 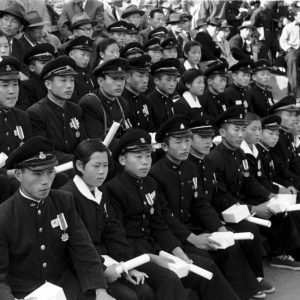 During his first tour in Seoul from 1957 to 1967, he focused on Korean education and the rising generation of students. 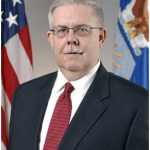 He gave a brief account of one long-running program by the U.S. Information Service – democracy education — in his oral history interview with the Association for Diplomatic Studies and Training in 1988. 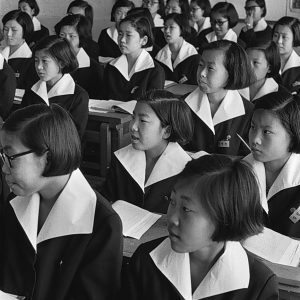 Korean students, 1960s. Photo credit: Chosunilbo Media & Chosun.com. In his 2007 book, Nation Building in South Korea, Gregg Brazinski – now Professor of History and International Relations at The George Washington University – wrote at length about the work of the U.S. Information Service in Korea in the decades after the Korean War. It was a tapestry of programs to strengthen the media and print culture, free elections and democratic processes, “economic growth, democratic social development, and political stability.” USIS organized exchanges, student leadership conferences, seminars, faculty tours, and English conversation clubs. Lavin’s work on democracy education fit within this large array. Organizing a program with comparable impact would be unlikely today. After the Korean War, Korea was open to new social concepts, and such moments are rare in any nation’s history. Then, one officer tended the program for the better part of a decade, giving it continuity and sustained focus. Now, every Public Diplomacy officer tends many portfolios, and the pace of both media and exchanges work is relentless. No post could now spare one of its officers for such intense work with faculty, education institutes, and the Ministry. The funds available to all but the largest posts would now be insufficient for a long-term program that involved so many seminars and meetings. And few posts could now afford printing and distributing 75,000 teacher’s manuals. American Public Diplomacy has become too busy and too light for such transformational work. I’ve edited Lavin’s account for brevity. LAVIN: … there has always been one objective that is common to all country plans — and that is the development of democratic concepts and democratic traditions . . . . Of course, in Korea we had such an objective . . . . I suppose we had more difficulty with this than any other objective in the country plan. . . . we had to think about and how to influence the course of democratic development in Korea. 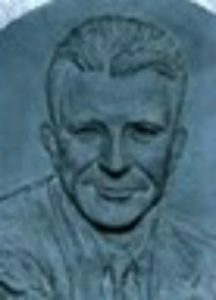 Winfield Niblo. Photo credit: yougaku-data.com. Korea has had since ancient times and probably will have for thousands of years more — the Confucian kind of stratified society where everyone from the oldest living member of the family down to the last daughter-in-law (who gets all the dirty jobs to do in the house). Everyone has a position of seniority, rank, responsibility and status — from high to low. To try to develop democratic concepts . . . I saw it as an educational process that had to be initiated if we were going to be successful over the long term. In 1959, we had a visit from Dr. Winfield Niblo who was then a professor at Columbia University Teacher’s College. He visited Korea under what we then called the Smith-Mundt program. He described to us the materials that had been developed at Teacher’s College under a grant from the Carnegie Foundation. It was called the Citizenship Education Program (CEP) to be used in the American school system. They were very impressive materials indeed. Well, as I studied them I realized that this was a magnificent research task that had been done by Columbia . . . I proposed to Hunt Damon that perhaps what we could do was try to get these materials Koreanized . . . in their own language . . . and within the cultural concepts that the Koreans could understand — because some of the examples that we used in the American school system would not be understandable to Koreans. Paik Hyun-ki. Photo credit: naver.com. The important thing was to select some kind of a cosponsor who could help us get these materials “Koreanized” and into the Korean educational system. I examined exhaustively schools of education, educational research groups and institutions throughout Korea. Finally the selection came down to what was then called the Central Education Research Institute [CERI] . . . . As it turned out, the director of that institute had received his Ph.D. in education from Teacher’s College, Columbia. And so he was very familiar with the whole idea. His name was Dr. Paik Hyun-ki. Now, very briefly, what were the concepts? Now, this concept was so important because dignity, of course, is ingrained in Korean in the Confucian system — but along with it goes the idea of superiority and inferiority. We took that first concept and here is how we handled it. For instance . . . we took a newspaper clipping . . . and in that clipping it reported that on such and such a date, Miss Kim, a maid living up in one part of the City of Seoul, was beaten by a certain man because she owed him 200 won. We left the story unfinished (using the problem solving technique of the citizenship education program at Columbia University). We left the solution to the teacher and the students as they would have dialogue back and forth. In the teacher’s guide we put in ideas like why did that man beat the maid? Because she owed him 200 won? (Two hundred won was a very small amount of money.) Well, it turns out that the reason he beat her is because she was only a maid, and he felt he had higher status. And we noted that in a democratic society no matter who you are, you have your rights as individuals and as equals. Well, that’s one way we handled the kinds of concepts that were included in the course content. The second concept was “taking responsibility.” The third one was “cooperation and community service.” Now, this was pretty difficult for Koreans to grasp in terms that we understand. They cooperate as family units. But . . . not in the community. The fourth one was “care for the handicapped.” Now, in our country . . . there’s been great attention and care devoted to the handicapped as equal members of society. That’s a wonderful thing and should prevail in any society, particularly a democratic society. In Korea we noticed . . . that Koreans would tend to laugh at, and scorn handicapped people. So we put that one in as a basic idea. And the last concept was the one that was the most difficult to handle. “Choosing good leaders.” That gets you into elections and national and local politics.
. . . there was great enthusiasm both in Washington and certainly at the post, after the usual skeptical questions. The Columbia University materials gave us a very solid educational foundation on which to build. And when it became clear what the intention was and that we planned on using a fair amount of our resources for a long period of time in seminars and other kinds of programs, our support colleagues said it’s worth it. I had talked to the AID representatives in Seoul and they were fully in support of it. Their reaction was, “We wish we could do it. But we are so occupied taking care of rebuilding Korean schoolrooms throughout the country and trying to acquire textbooks that it’s impossible for us to take it on. It is the prime work of the United States government to do this sort of thing.” Thus USIA became the action-oriented group and with support from Washington certainly everybody at post got into the programming on this. Chung Bum-mo. Photo credit: Hallym University.
. . . we decided we would start off the process by bringing together the best educators in Korea, not only from Seoul but from the provincial areas also. And so it was decided that in July of 1961 we would hold the first seminar at the Haeinsa Buddhist Temple in the Taegu region. The reason I selected a Buddhist temple site was to emphasize to the Korean educators (and the American staff) that the educational process of democratization was a Korean task, not an American task. I said, “Why not? [T]his will be an education for them and they’ll see that we are not subversive.” . . . And sure enough at the noontime the two generals and the KCIA official joined us for lunch and then disappeared because they could see it was an educational program and not a meeting of subversives. So we carried on. And it was determined by the whole group that we would Koreanize all of the materials that would be selected out of the Columbia University materials. . .
the Koreans themselves who were at the seminar would do basic research and implementation. . . . It was also decided that we would develop what we called the “Teacher’s Manual” . . . The plan was to put this teacher’s manual into the hands of teachers all over Korea. We knew that the Ministry of Education would never allow any new courses to be instituted without their full approval, most particularly in moral education. We decided to publish the manual as a supplementary textbook for teachers to use in their moral education courses. This was very well received by the Korean teachers because many of them told us privately that they were responsible for teaching moral education, and that they really didn’t know what to teach. Well, we got to that point where we had a teacher’s manual ready. I guess it was around 1963 or so. And we published in Korean 75,000 of these teachers manuals. Well, by this time the Ministry of Education was fully aware of what we were doing. And one day they sent over word that the Minister of Education, who was a good friend of ours, was so appreciative of this kind of work that he asked that his picture and his message be put into the manual. Kim Ran-su. Photo courtesy of Yonsei University. So the book went throughout the school system . . . after I went back to Korea in 1981 on my second tour . . . one of the professors who started off this program with us back in 1961, had by then in part because of his work in citizenship education became President of the Taegu Teacher’s College. . . . he said, “I still have the Teacher’s Manual and I still use it.” That was very good to know. To make a very long story short, the 60 professors who worked with us in 1961 and following became resource persons with USIS support for seminars at the USIS offices in Taegu, Pusan and Kwangju and at Korean schools. We held quarterly seminars to discuss the results and identify problems. We discovered in later years that as a result of these professors’ participation in CEP (they came in contact with thousands upon thousands of Korean educators) their reputations were enhanced. In my second, tour (1981-86), one of them, Dr. Kim Ran Soo . . . became so well known through his writings and books that he published on citizenship education and by meeting educators all over the country.